While it was certainly an entertaining premise to set the recently rebooted Spider-Man 2099 series in the present day, thereby making it a pseudo “fish out of water” story with a unique twist thanks to Peter David’s wittiness, it felt all too inevitable that the series would eventually send Miguel O’Hara back to the future and to the world David and Rick Leonardi originally created for him in the early 1990s. Was I ready to wager on the idea that this switchback would take place in the sixth issue of his series, smack dab in the middle of the biggest Spider-Man event to take place in more than three years? No, but I enjoyed getting reacquainted with Miguel’s brother Gaby, Tyler Stone and the rest of the 2099 crew all the same. It’s like getting back in touch with an old friend who’s been away for a couple of years. Sure you could just look through a photo album or make a phone call and say hi, but the reunion is so much nicer and enjoyable when it’s in person and directly in front of your nose. 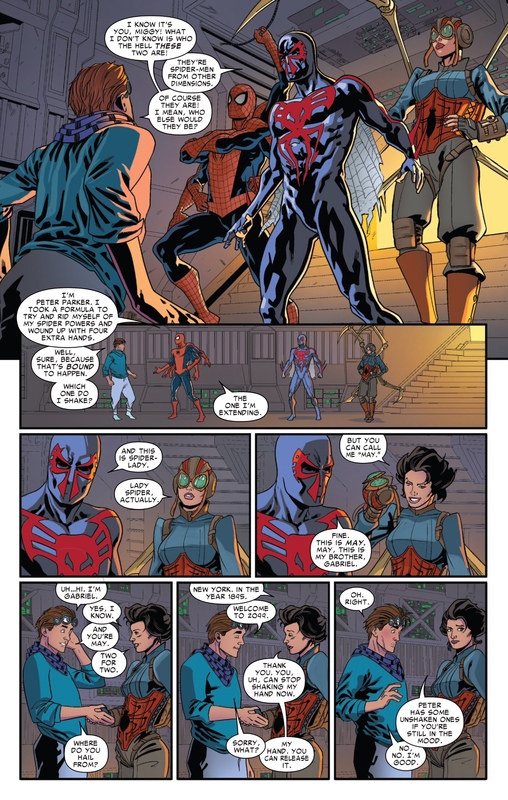 Plus, David manages to tie Miguel’s return to 2099 into the larger “Spider-Verse” story very effectively. 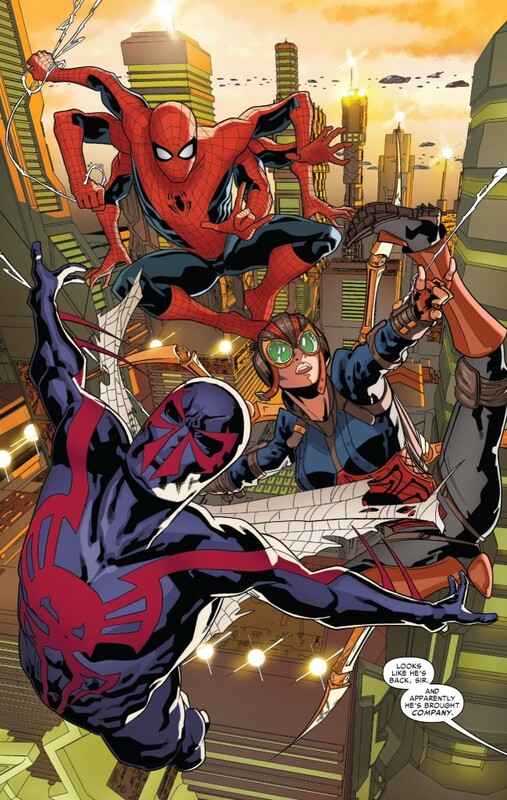 While the other Spider groups that have been featured in books like Spider-Woman and Scarlet Spiders seem to be trying to defeat the Inheritors from a point of unfamiliarity, Miguel and his crew, which include Lady Spider and the Six-Armed Spider-Man, have a distinct home field advantage in Spider-Man 2099 #6. Of course, poor Six-Armed Spider-Man would probably disagree about any advantages the crew had (while Will Sliney’s pencil-work wasn’t entirely clear during this sequence, I’m going to assume in “Spider-Verse” that when an Inheritor says someone is dead and “tasted good” then I shouldn’t expect that character to jump back up and say they’re fine. So RIP Six-Armed Spider-Man). 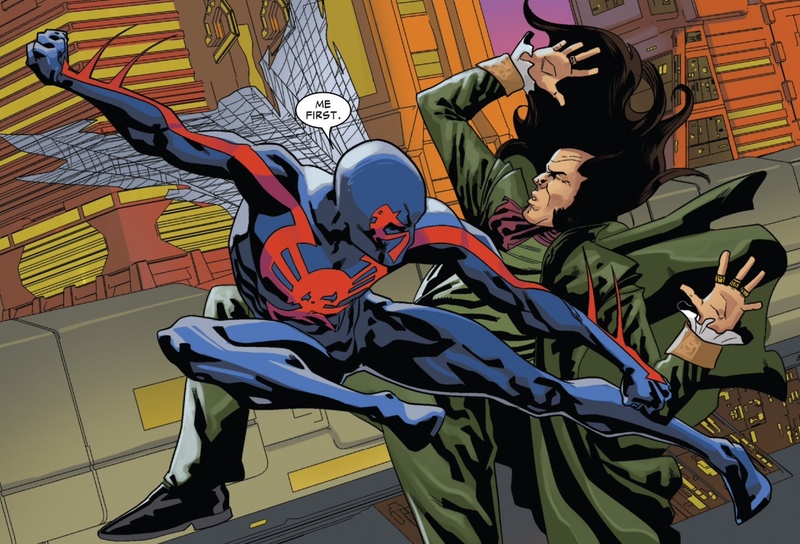 However, Spider-Man 2099 #6 is the first of the “Spider-Verse” crossover books that ends on a somewhat celebratory/triumphant moment for the Spiders after Miguel is able to capture and contain Daemos. That, combined with David’s always entertaining dialogue makes for a run read. 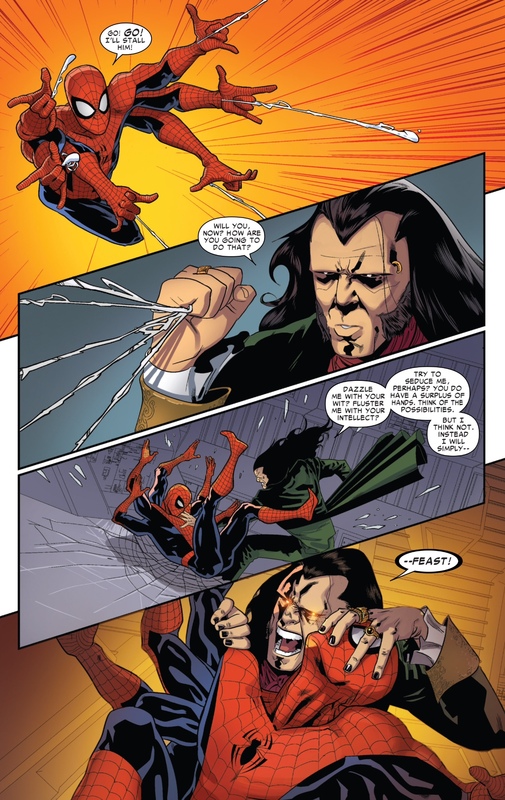 Still, despite these unique wrinkles, all of these “Spider-Verse” tie-in stories seem to be settling into a template of sorts that’s starting to get repetitive barely a month into this event. 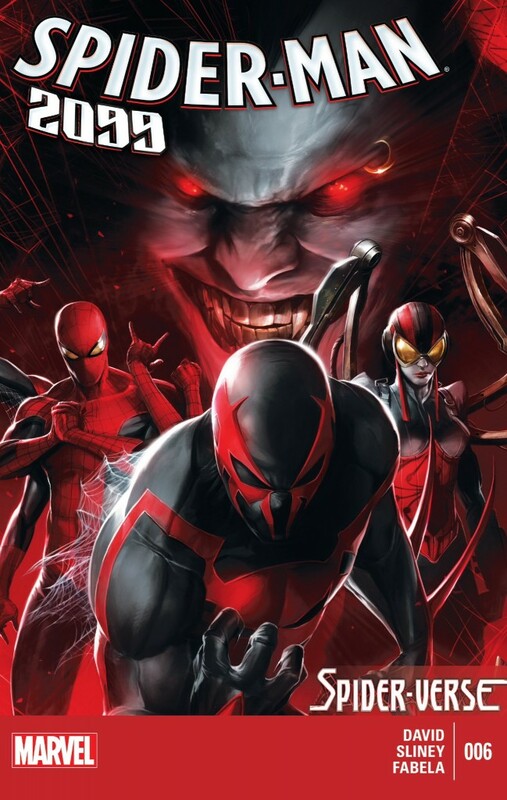 Each one of these issues takes two or three Spider characters and interchangeably sends them on some sort of side-mission to deal with the Inheritors. Not to contradict something I praised in my write-up of Scarlet Spiders #1 earlier this week, but as much as I appreciate how these characters are having their own adventures away from the main action in Amazing Spider-Man, it would be nice to get a bit more diversity in the narrative. Otherwise, we’re just left with something that reads a bit too formulaically, which is typically the last thing I ever hear myself saying when discussing a Peter David comic. Additionally, there definitely seems to be a soft push to make Lady Spider a “thing.” It’s not that I doubt the character’s potential, but we were only introduced to her earlier this month via a “B” story in Spider-Verse #1. The character concept and her costume are pretty cool, but I just need a little more time to get to know this character before I’m ready to get all too excited about her. As such, having her be the object of Gabe’s affection, while also setting her apart from the rest of the inheritors because she’s not a “pure” Spider, seems like an inorganic way to draw attention to the character. I could just be speculating here, but it seems like ever since the explosive popularity of Spider-Gwen’s first appearance in September, Marvel has been trying to recapture that lighting in a bottle with some of its other new characters. But there was just something special about Spider-Gwen from the moment that preview art first dropped. In other words, I know Spider-Gwen and Lady Spider is no Spider-Gwen.